The Kitchen Gnome is generous. He claims that I make the best Chicken Piccata. He has sampled the dish in some of the local restaurants and maintains that he is correct. He is sweet. I came across the recipe in 2002! I make it the same every time. I have only tweaked it a tiny bit. Nothing can compare to the snap of lemon with the first bite! The recipe came from the sample issue of Cuisine at Home Magazine. Needless to say, I have subscribed since the sample issue! I served the Piccata with Wine Lovers Rice and steamed brussel sprouts. Steamed sprouts suited my timetable on this evening. My daughter, though, just made Brussel Sprouts with Browned Butter and Toasted Almonds that she claims is the best. It sounds as though it would be a great match to the Chicken Piccata. You can get that recipe on her blog, A Bit of Butter. Season the breasts with salt and pepper, lightly dredge in flour. Heat olive oil in saute pan over medium heat. Saute breasts 3-4 minutes. Flip and saute the other side for 3 minutes. Cover the pan with an inverted plate, to warm it. Transfer breasts to a warm plate; pour fat from the saute pan. Deglaze saute pan with wine and add the crushed garlic. Cook until the garlic is slightly brown and the liquid is nearly gone, about 2 minutes. Add stock, lemon juice, and capers. Return breasts to pan and cook on each side 1-2 minutes. Transfer breasts to a warm plate. Finish the sauce with butter and lemon slices. When the butter has melted, pour the sauce over the chicken breasts. Sprinkle with chopped parsley. This is a favorite recipe at out house. Fresh lemons are key to its success! I am participating in Foodie Friday, hosted by Michael at Designs by Gollum. Take time from your busy day to visit and take a look at what the fabulous participating cooks have prepared! My parents love chicken Piccata and I make it for them often. Yours looks lovely and isn't your husband sweet! I had to go check my recipe, and sure enough it's the same one. It's a household favorite here and it's sooo good for company. Have a good weekend. Both dishes look very pretty! Thanks for stopping by my place and leaving your comment! I don't use a recipe per se, but that's how I make it. It is one of my favorites. The chicken with lemons looks fabulous! Yummy! This looks awesome...can't wait to try it! This dish made me salivated, this is really good.Thanks for sharing. This one of our favorite sauces, so I know I'll love this dish. 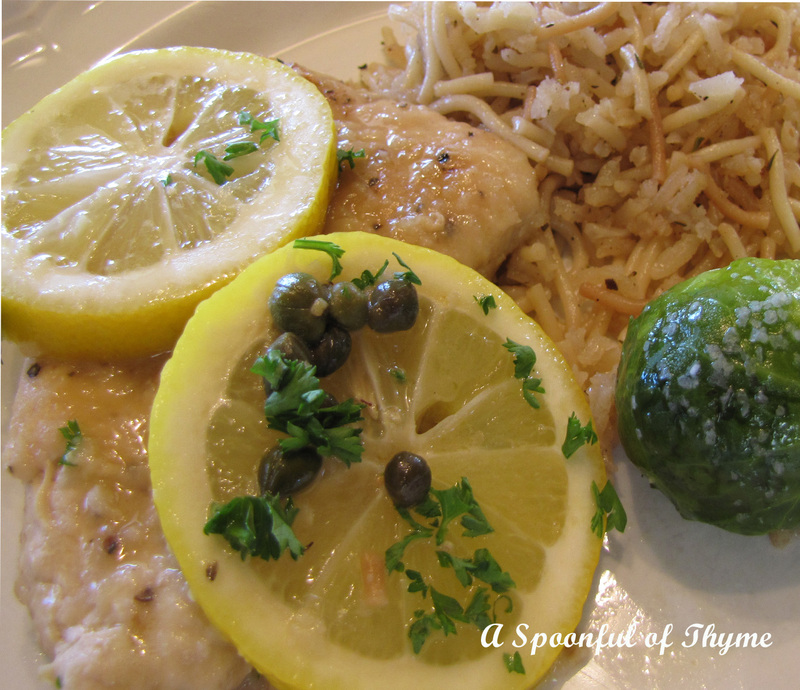 We use garlic-lemon-butter for the sprouts after steaming and lemon-butter-capers for fish. this looks really good. I love chicken piccata. 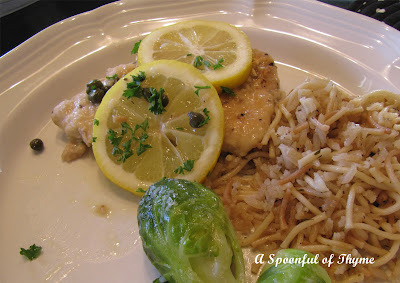 I am going to make your rice tonight..we are having fish..it will go well..and I will try your ?Cuisine at home version of The Piccata soon..It's one of my favorite dishes. You've got my mouth watering with this dish, Kate. 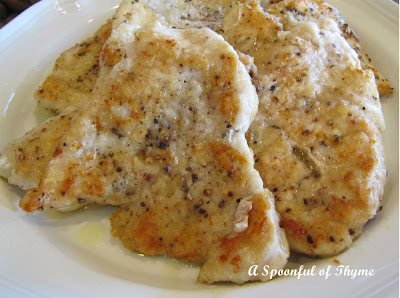 I love chicken piccata and make it with sole also. The combination of capers and lemon is scrumptious. This is sunshine in an entree. 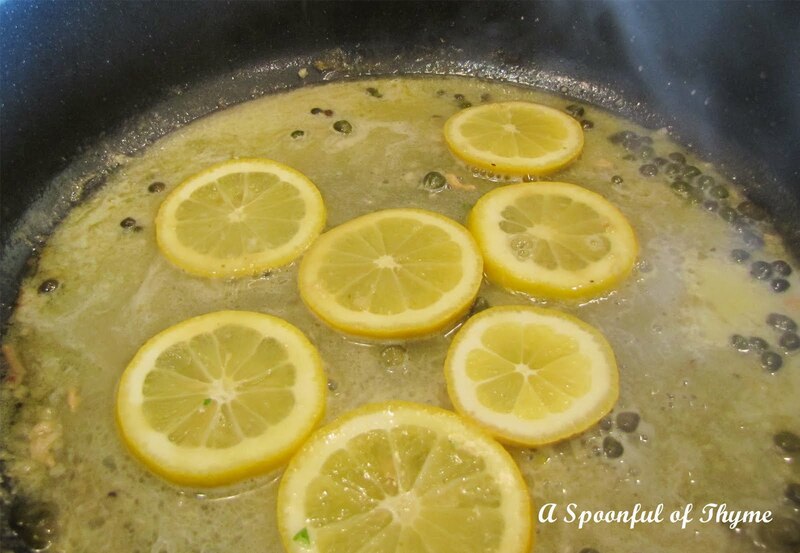 I love anything with lemon and am thrilled to have this recipe! Have a great weekend! Your piccata looks fabulous! I remember that sample copy of Cuisine, too! 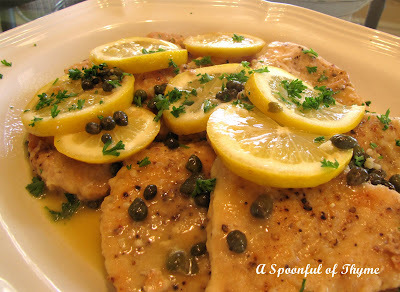 This sounds wonderful and I must confess I have never made Chicken Piccata - strange but true! Your recipe sounds fresh and delicious. 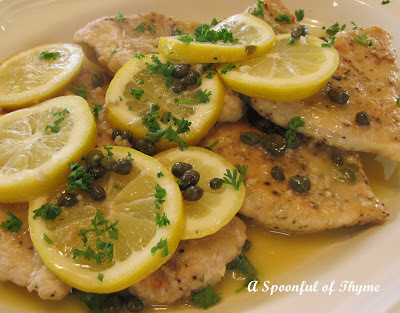 Chicken Piccata is one of my favorites! This sounds very close to the recipe I use and we love it, too! I think it's a special treat for us and pretty and different enough to make for company, too! Mmmmmmmmmmm my mouth is watering!! Spring is Wild Flower Season! Oldies But Goodies - The Mighty Casserole!